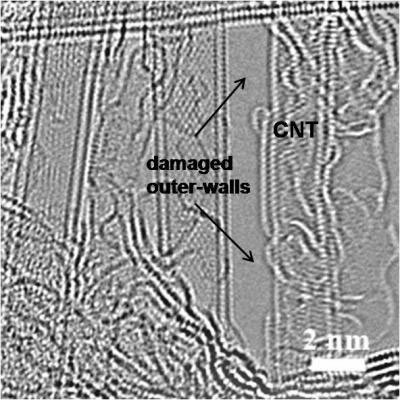 (Nanowerk News) Multi-walled carbon nanotubes riddled with defects and impurities on the outside could replace some of the expensive platinum catalysts used in fuel cells and metal-air batteries, according to scientists at Stanford University. 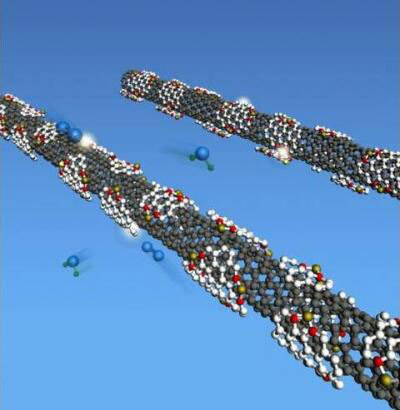 Their findings are published in the May 27 online edition of the journal Nature Nanotechnology ("An oxygen reduction electrocatalyst based on carbon nanotube–graphene complexes"). Over the past five years, the price of platinum has ranged from just below $800 to more than $2,200 an ounce. Among the most promising, low-cost alternatives to platinum is the carbon nanotube – a rolled-up sheet of pure carbon, called graphene, that's one-atom thick and more than 10,000 times narrower a human hair. Carbon nanotubes and graphene are excellent conductors of electricity and relatively inexpensive to produce. "For the first time, we were able to image individual atoms on this kind of catalyst," Dai said. "All of the images showed iron and nitrogen close together, suggesting that the two elements are bonded. This kind of imaging is possible, because the graphene pieces are just one-atom thick." This work was supported, in part, by a grant from the Precourt Institute for Energy at Stanford; Intel; Lawrence Berkeley and Oak Ridge national laboratories; the Department of Energy; and the National Science Foundation.